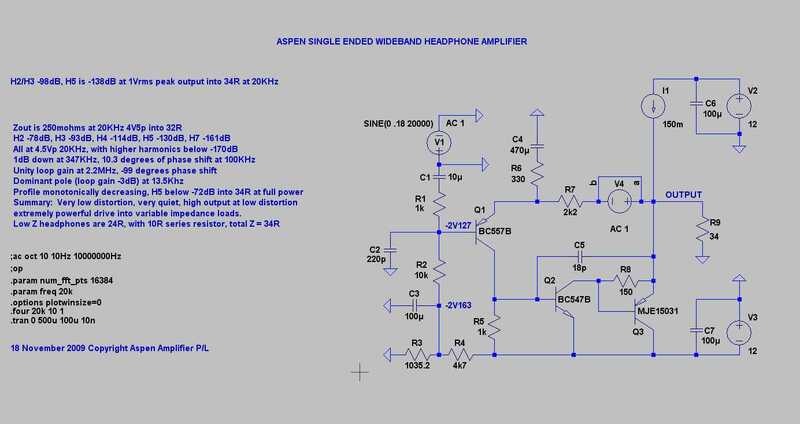 In the spirit of DIY, I've decided to offer a simple headphone amp. Gareth Ingram (aka Bigun) of Ontario will be directing this thread, schematic attached. Here are links to all the Haksa circuits courtesy of Gaetan, thanks mon ami!! Last edited by AKSA; 25th November 2009 at 09:22 AM. I hope this is in keeping with the spirit of DIY. Last edited by jam; 21st September 2009 at 10:45 PM. Yes, Jam, I'm sure you would - and thousands of other designers. However, that is a deliberate choice, and yes, I assure you, it's in the spirit of DIY!! Simple, easy to build and I'd guess as good (or better) than most out there. Will Gareth work up a board for this? The simplicity is important for builders, but belies some interesting things going on, as you are well aware. There are many AKSA concepts in this little amp. Very nice and simple, for sure it will sound very good and there is a well chosen caps value for the vas and a phase lead cap. You can just use a zener, a resistor and a cap for the diff. pair and VAS regulation, I do that in my own amp and it's very good and simple. You can also match VBE and HFE of the two diff. pair transistors. And, After adjusting P1 offset, if you adjust R4, so R2 and R3 will have same DC voltage drop, you will gain more definition and better soundstage. I alway do those two things in my amps. Last edited by gaetan8888; 22nd September 2009 at 12:02 AM. First, thanks for sharing your design. Second, couple of quick questions. What's your recommendation for v4? Has anyone built this yet? Last edited by iko; 22nd September 2009 at 12:26 AM. I've always thought this general topology (RCA, TGM, D.Self etc.) to be a winner. It's flexible, robust, great sounding and a good path forward for DIY if you've started with a chip-amp or similar. One thing about a power amp for DIY are a few subtle and not so subtle things you have to worry about, such as power supply, safety, thermal management, device reliability etc. So a better starting point is lower power. I thought it would be great to have an amplifier for my desktop that could drive some desktop monitors and yet doubled up as a high quality headphone amplifier. As Hugh says, I'm tempted to keep the power output devices in place for driving the desktop monitors. These are typically small inefficient drivers, not always 8 Ohm so a bit of grunt will be helpful. My starting point is a maximum output of +/-8V into 8 Ohms working in ClassAB, allowing for transient swings up to +/-12V would imply a +/-15V supply. I would set up the biass current through the output devices so that they stay in Class A when driving a set of 23 Ohm headphones. Best of both worlds. That would certainly clean up the performance of the LTP and put a firmer grip over the VAS. On the other hand, the bootstrap is so efficient, small parts count, low cost, reliable and gives excellent results. I've used this approach before and love the results, I believe it's more 'musical'. A current source on the LTP is a good option for improved PSRR and other things. It could be more important with the relatively low supply rails because we can't use such a high value resistor if it's a simple feed. Again though, many good reports from amps which use a simple resistive feed in terms of musicality. Maybe we need to try it both ways ? Good question. You could actually simply use three 1N4148 diodes in a string. That should give around 2.1V of bias voltage, which would translate to 45mA of bias current. It's simple, and effective. Two of the diodes should be thermally coupled to the small heatsink used to keep the outputs cool. This small amp has lots of phase margin, 75 degrees at 12MHz, the dominant pole. It would be very good with electrostatic headphones (Stax). There is a possibility that lag compensation (Cdom) could be reduced to 18pF. This would chiefly affect imaging performance.